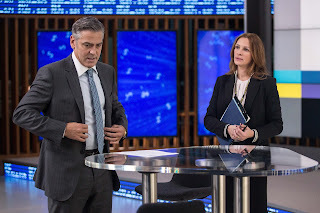 A hostage thriller, Money Monster addresses the collision between television celebrity business advice and the real world where investment decisions can have ruinous implications. 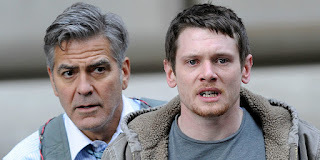 Lee Gates (George Clooney) hosts the weekly live Money Monster show on cable television where he dishes out stock investment tips in a glib flash-and-dash format. The more grounded Patty Fenn (Julia Roberts) is his producer, and she stitches the show together despite Lee's often juvenile antics. During live filming, the stage is invaded by Kyle Budwell (Jack O'Connell), a deeply disturbed man waving a gun. He forces Lee to put on an explosive vest and insists that the cameras keep rolling. Kyle is upset that he followed Lee's advice on a previous show and invested all his life savings in the stock of a company called IBIS Global Capital, run by CEO Walt Camby (Dominic West), who has now disappeared. IBIS stock promptly tanked when the company lost $800 million due to a so-called algorithm glitch. Live on-air, Kyle rails against the corrupt system. With Patty communicating through his earpiece, Lee regains his composure and tries to buy time by trying to find answers as to what really went wrong with the stock. The solution to the mystery of the missing millions passes through IBIS Chief of Communications Diane Lester (Caitriona Balfe), as well as an algorithm expert in Seoul, hackers in Iceland, and a miners' strike in South Africa. 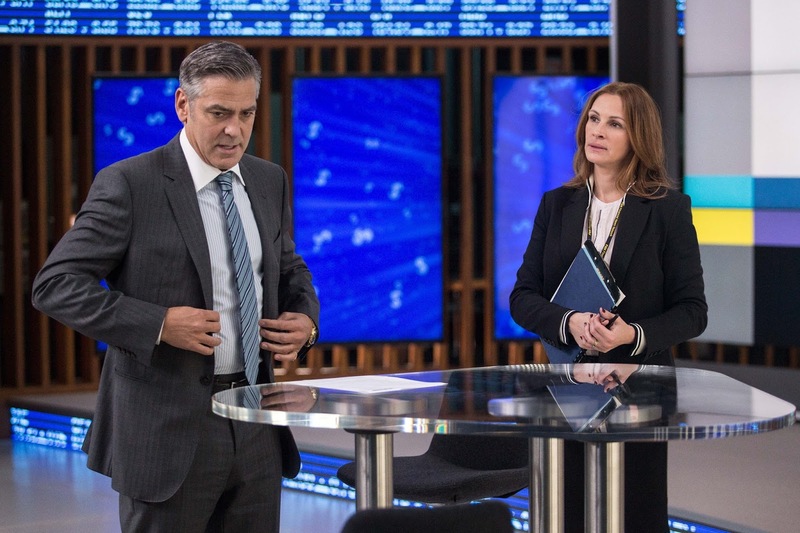 Directed by Jodie Foster, Money Monster works well when it's within the confines of the television studio. With an unstable Kyle hijacking the show, Lee's world flashing before his eyes and Patty trying to maintain some semblance of control, Foster constructs a taut story that gives a face to the victims of stock market machinations and exposes the shallow world of television punditry. The film maintains a steady current of tension, with the aggressor's instability invading the carefully crafted world of slick marketing, and just the right drizzle of humour injected to keep the drama in check. The script (co-written by Alan Di Fiore, Jim Kouf and Jamie Linden) works its way to the uncomfortable foundations of the modern system of capitalism. Honest blue collar working men like Kyle are the recession victims, and their only mistake is trusting the make-believe world of charlatans like Lee Gates, a modern-day snake oil salesman. Walt Camby is revered for creating wealth by transferring money using inexplicable software, and while he is the celebrity of the business world men like Kyle simply pay the price in wrecked lives. The parts of the film away from the studio are not as impressive. Foster takes brief sojourns to Asia, Europe and Africa to underline the interconnected modern world of global finance, but these scenes end up being mere snippets. The final third breaks out of the studio completely with the quest for answers spilling into the streets of Manhattan, and the film starts to unfortunately resemble a contrived Bruce Willis type action film. The two central performances are excellent and never flag. George Clooney and Julia Roberts, despite sharing few scenes together, exude smooth star charisma and confidence. Clooney's wattage translates perfectly to the cocky personality of Lee Gates, forced through the hostage ordeal to see himself as others see him. Roberts' calm performance allows Patty to emerge as the one voice of reason is a world gone quite mad in pursuit of riches and revenge. Jack O'Connell is suitably unhinged, giving Kyle depth as a man seeking apologies and answers, but not without faults of his own. In a world where money is virtual and no questions are asked as long as wealth is created out of thin air, Money Monster has no heroes, just victims and charlatans.